I’m so happy to be popping by today from Making it in the Mountains, where I write about our journey to renovate our first fixer-upper. 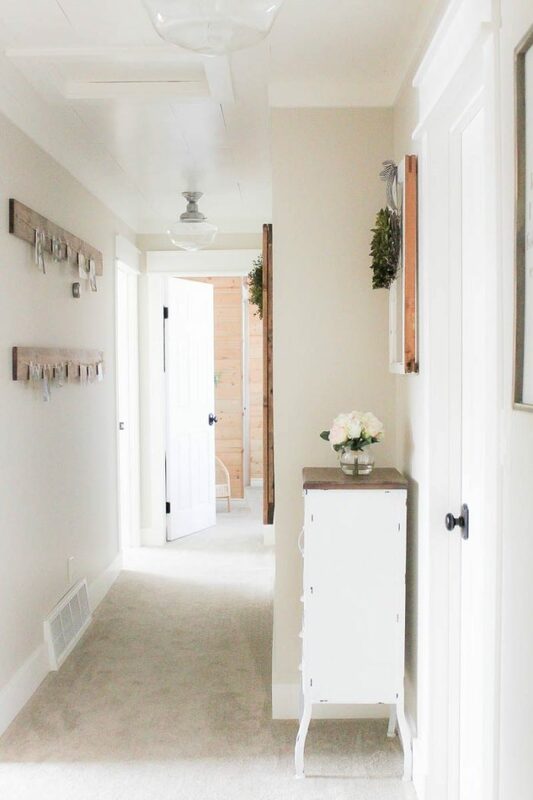 I’ll be the first to admit that turning an old house from the 70’s into the beautiful farmhouse of my dreams isn’t exactly easy, but, we sure are giving it our best shot! You can check out all of our progress in our Project Gallery. Most recently, we’ve been hard at work creating my new home office and I can’t tell you how excited I am to see this space come together! For years now I’ve been dreaming of a space all my own, where I can create & write to my heart’s content. 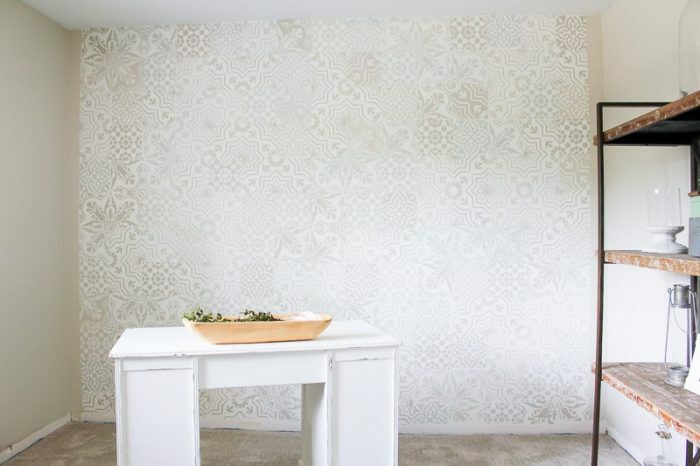 I’d say I’ve got a pretty great start with a gorgeous feature wall (see how I got that cement tile look for less than $100 here) and this beautiful vintage desk. But now, I can’t wait to fill it with all sorts of pretty decor and accessories to get things organized and really make it my own! 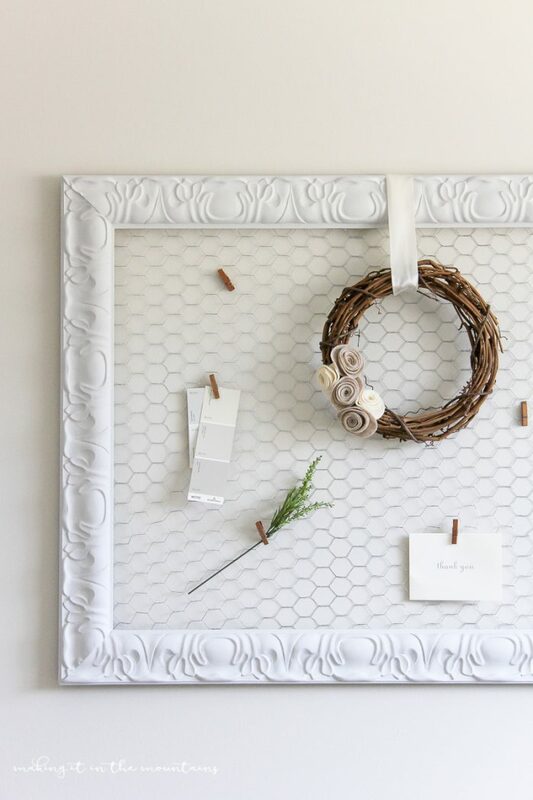 Starting with this pretty farmhouse style DIY memo board. 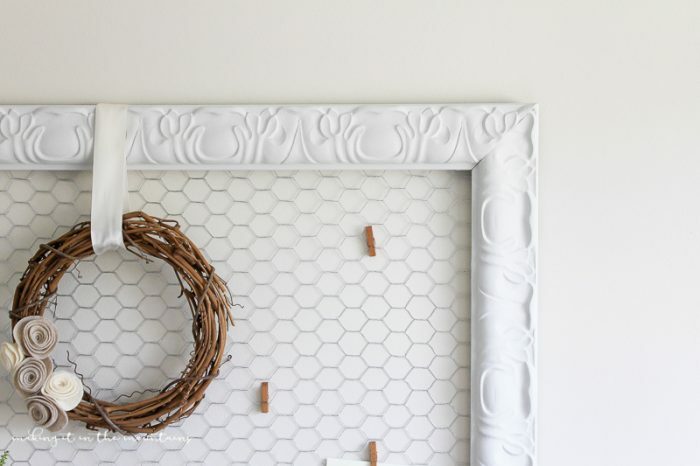 You won’t believe how simple and inexpensive this was to make! I started with a big ol’ empty frame I’ve had laying around for ages. 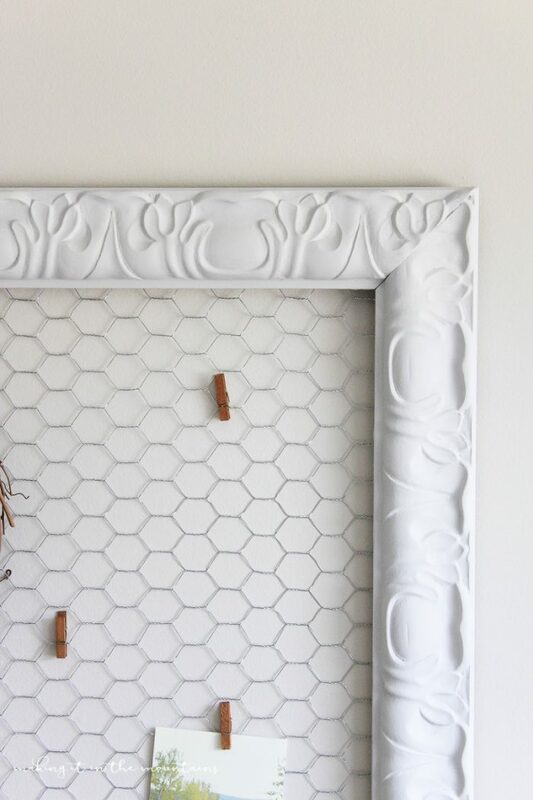 Now, if you don’t have anything around your house that would work, keep in mind that beautiful old frames are a dime a dozen in thrift stores or at garage sales, and often for a really great price. After wiping it down, I slapped on a quick coat of this chalk paint in Lazy Linen. 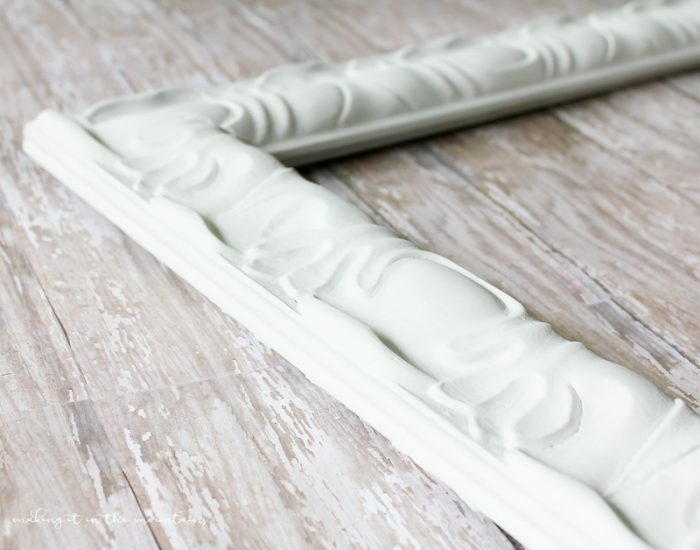 Spray paint would be a great option here too, but I really love that shabby-chic look of chalk paint. Then, I used a pair of wire cutters to cut a square of plain old chicken wire to cover the back of my frame. 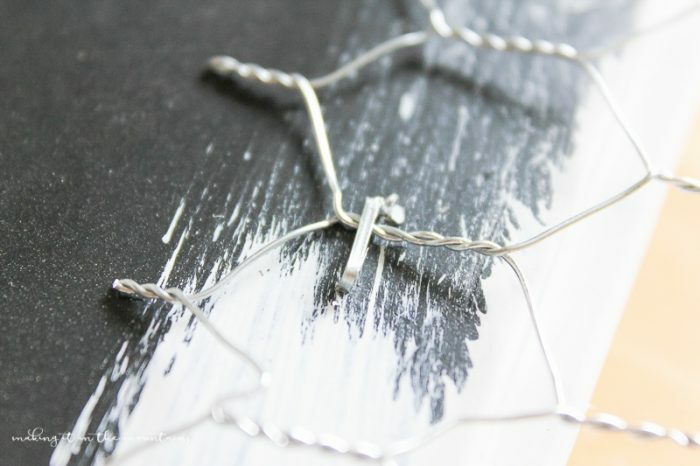 Using my staple gun, I attached the chicken wire with a few staples all the way around the outside edge into the back of my picture frame. What’d I tell ya? SUPER quick and oh so easy! I just used a few sweet little clothes pins to hold some photos and notes on my board. 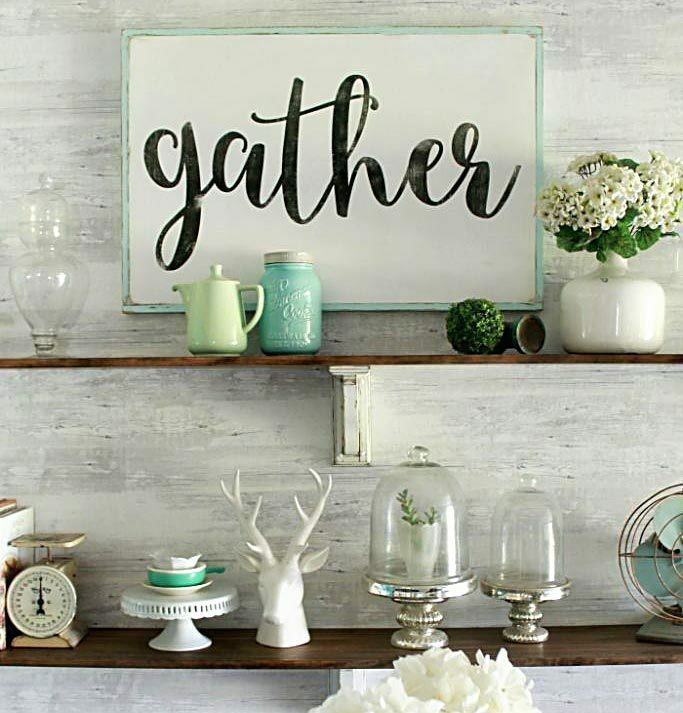 I really think this is such a lovely way to display all sorts of special treasures! 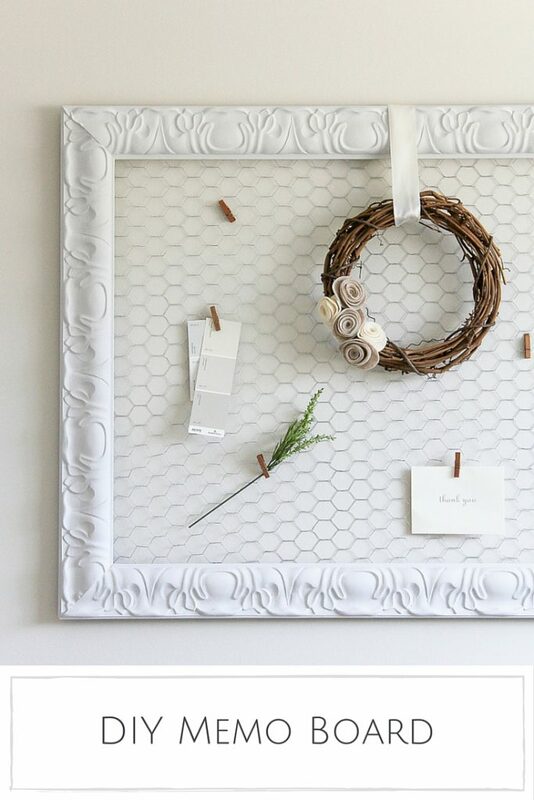 Where would you put this pretty board to work? Wishing y’all SUCH a lovely day! 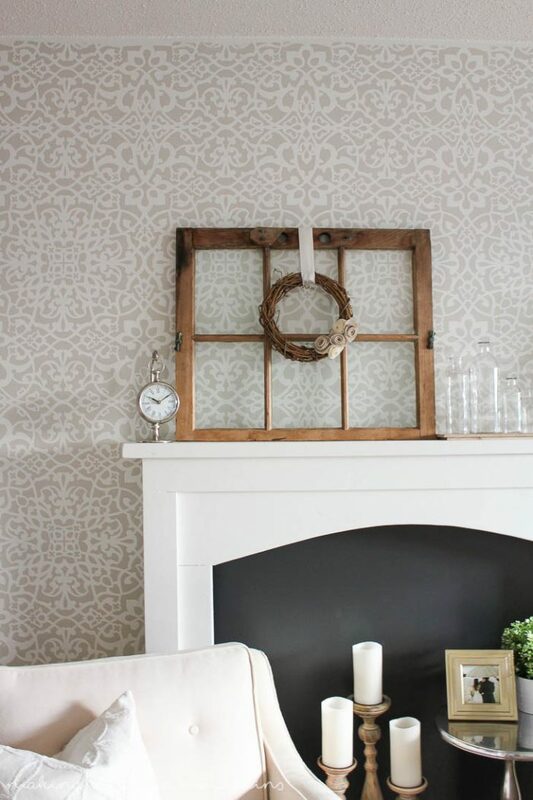 and this beautiful DIY Faux Fireplace! Agree, Shawnna, so dang cute!! 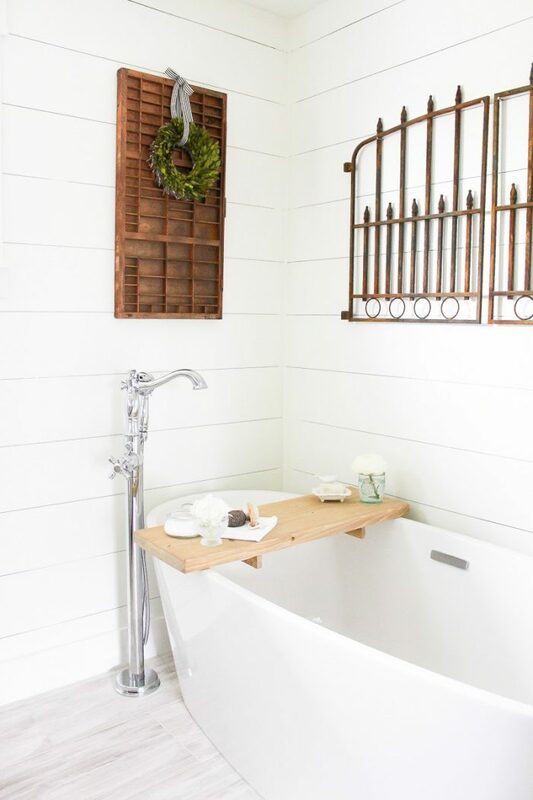 Hi kristi, i absolutely love your farmhouse style ! 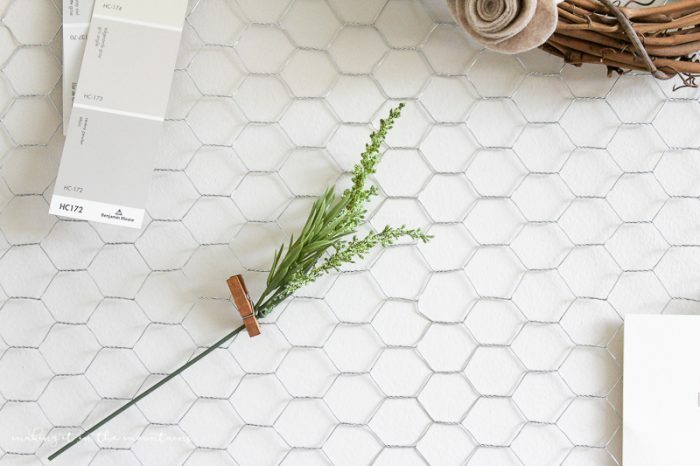 It’s not your typical farmhouse, it’s fresh, young and darling. I love everything I’ve seen so far and can’t wait to see more. 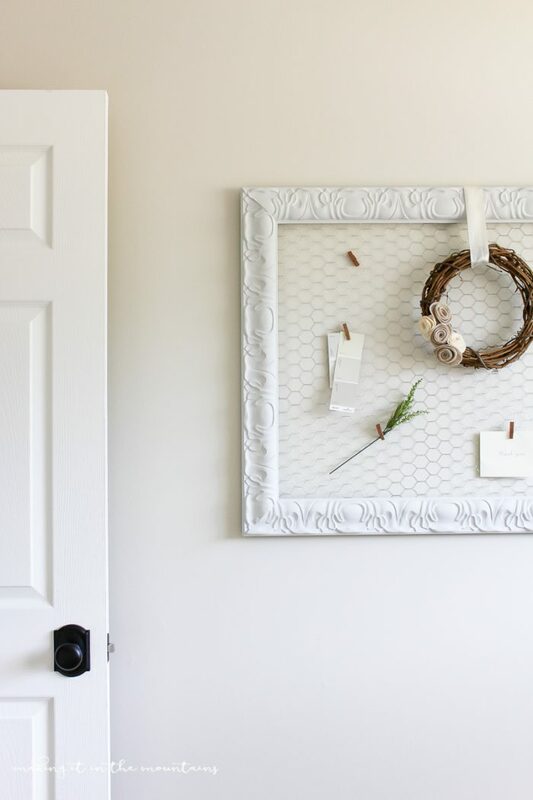 Your latest memo board is so cute and i have everything i need in my basement so that is where everyone will find me today. The only thing I don’t have are those darling little clothespins, i have regular ones, but have never seen those wooden ones that are little. I’ve seen the plastic colored ones for a baby shower or something like that but not wood. Can you please share with me where you found them, hopefully not at some estate sale or barn sale where i would never be able to get my hands on some, ( : Thanks for sharing info if you can. Looking forward to seeing your next creation. Kristi will write ya back! Love your comment, lol! You are just the sweetest! Thank you so much Diena! I’m so happy you’re feeling inspired! I picked those little clothes pins up at Michaels actually (they have a great selection), but you should be able to find them at any craft store really. Also, I just checked for you and Amazon has a ton of great options too if you search for “craft wood clothespins”. Hope this helps! I would love to do this in my bedroom!!! This would be perfect in a bedroom! SO happy you’re feeling inspired! Thanks so much Ryleigh! I definitely need to get me some chicken wire!! But that is the most beautiful frame! I have quite a stash, but nothing that compares with the pattern on yours, it looks so classy or “country classy”. You and your sister are SO talented and creative!